Semi-fitted shirt has collar and shaped narrow hem. A: pockets. 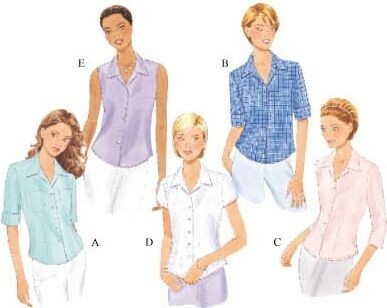 A,B,C: three quarter sleeves ( A,B shown fold back). C,D: side slits. D: above elbow sleeves. E: sleeveless. Purchased bottom. Cotton Shirting, Lightweight Denim and Lightweight Broadcloth.